We love bubbles at Steve Spangler Science. We’ve made frozen bubbles, smoky bubbles, giant bubbles, bouncing bubbles and fire bubbles to name a few. This time, we make colorful, snaking bubbles that come out of a homemade bubble blower. Bubbles usually only come as individual spheres of soap and water. To blow the perfect bubble takes patience and a little bubble-science. Sometimes, if you’re lucky, you can get a whole bunch of bubbles in one cluster… but it always seems random. We’ve found a spectacular way to create colorful rainbow snakes made of bubbles. Make red, white and blue bubbles for Fourth of July. For more on the science of bubbles, how to make the perfect bubble solution and how this works, visit the Bubble Snake Experiment page. Find a clean, empty plastic bottle. While a 16 or 20 oz bottle will work the best, feel free to try any size bottle you want. Maybe the results will be something crazy! Blow into the mouth of the plastic bottle and, before you know it, you’ll be creating Bubble Snakes like a pro! Let’s take it up a notch by adding some color! Find some liquid food coloring in your favorite color(s). Add a few drops of the food coloring to the fabric on the end of your bottle. Get creative! Dip the fabric in the bubble solution and give the bottle a blow… HOLY MOLY! You’re creating some super colorful Bubble Snakes! 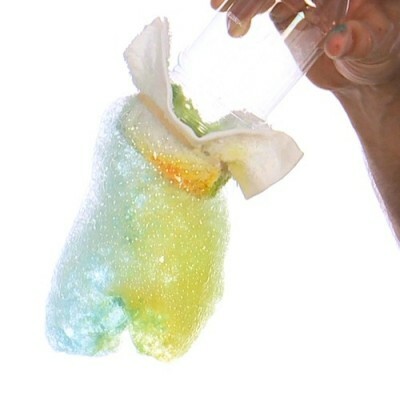 For all of our Bubble experiments and activities, visit The Lab on SteveSpanglerScience.com.